The Bucket List (for fish and chips in a bucket, not surprisingly). 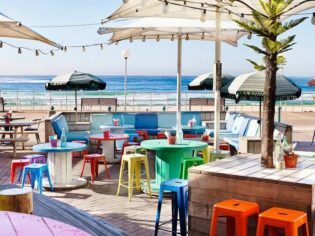 Despite considering himself a Bondi Beach outsider, Icebergs Dining Room and Bar head chef, Monty Koludrovic, who’s headed the local institution since 2014 and lives in the ’hood, knows the truly local foodie and bar cool-spots. And it’s hard to question Monty’s credentials; he’s worked closely with Marco Pierre White on MasterChef, which not surprisingly he lists as a fascinating, challenging and priceless six months of his life. Here he gives us his top six distinctly un-touristy food and drink options both to build your appetite and your Bondi Beach cred. Paradise Road‘s a really authentic-feeling venue, with great service, tasty food and exceptional drinks. For breakfast, try a good coffee and half a pink grapefruit. They even do boiled egg and soldiers. It gets better at lunch; fried chicken and waffles with syrup and bacon, or opt for a hearty burger. Like the good old Pizza Hut days, you can bring the kids along and they’ll get a special placemat and some pencils to keep them entertained. Monty’s choice: A long black. If The Anchor wasn’t so quirky it would just be super daggy. Smash a fish taco and some sweet potato fries for dinner and order from the excellent calibre of cocktails and spirits. If you arrive late they could have a bit of a sing-a-long to Bon Jovi going on. Monty’s choice: I like their martinis and they do a good Americano. The Neighbourhood has a great vibe with really big windows so the outside comes in. The bar is a nice place to sit, have a few drinks and snack in a sort of Asian way, but it’s actually not Asian. Monty’s Choice: Try a nice macaroni jaffle and a cold beer while the winds blow in. The place is not only beautifully designed, Da Orazio Pizza + Porchetta also absolutely cranks and if you ever have to wait it’s only for 20 minutes. The wine list is full of Italian whites and reds so there are not too many decisions to make. Inspired from regional Italian cooking, they do things like whole suckling pig porchetta, some traditional pastas and a wood-fire focaccia. Monty’s choice: A few lamb arrosticini and a Diablo pizza. You have to go to the Bucket List for fish and chips. The space is really open so it’s nice for lounging around and it’s simply full of the beautiful people. 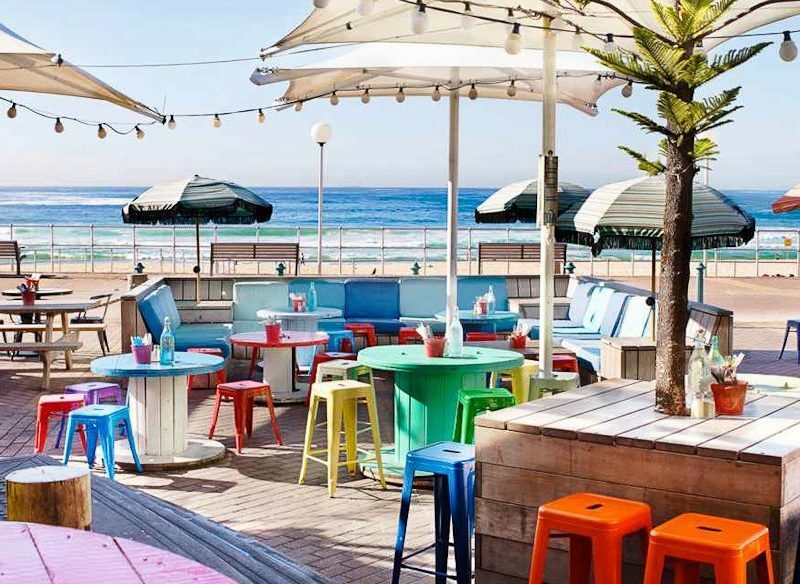 A couple of nice spaces to eat your takeaway fish and chips: the pool at south end or the grassy knoll at North Bondi. Monty’s choice: They do a battered hake and chunky chips, which comes in a bucket of course. These guys were one of the first bars in New South Wales to get a small bar licence. Come here for great coffee and unpretentious food offerings. They’re happy to do dips and breads and the menu changes quite often. The Shop isn’t a real wine-nerd’s kind of place, but it has a strong selection and the staff know enough about it. Monty’s choice: The meatball sandwich.